This showstopper is nothing short of g-l-a-m. Full of texture you want to reach out and touch (*ahem,* but probably shouldn’t), the tea-stained ombré effect ties each playful layer together. 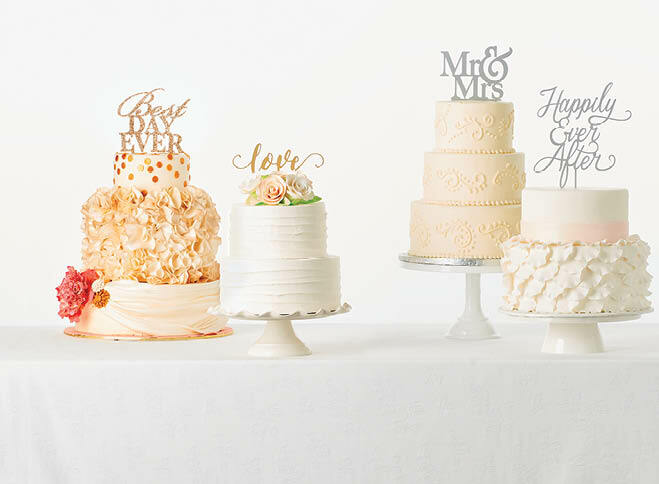 “I achieved all of the color results by hand-brushing different luster dusts onto the ruffles,” says Tamara Mugerauer, owner of Tamara’s the Cake Guru. Although the bold flowers at the base appear to be vintage pins sweeping up an organza sash, each is handmade of sugar. Under the fondant lies layers of pink champagne cake with strawberries and buttercream, completing the decadence. A glittering gold topper spells out the joy the day brings. At Regina’s Bay Bakery, “we think simple is better,” says owner Megan Rodriguez. She explains that the choice to decorate in one solid color keeps this three-tier cake elegant and understated. Raised dots of frosting dance along each layer like pearl beads on wedding lace. The repeating pattern lends balance and harmony throughout the classic butter cake. Filled and frosted with light lemon buttercream, this dessert is refreshingly fun and ideal for featuring a focal topper.